110V (plug-in) powered plug0in energizer kit that comes with the equipment needed to electrify your fence. Simply station at an outlet and run the insulated cable from the unit to the fence. 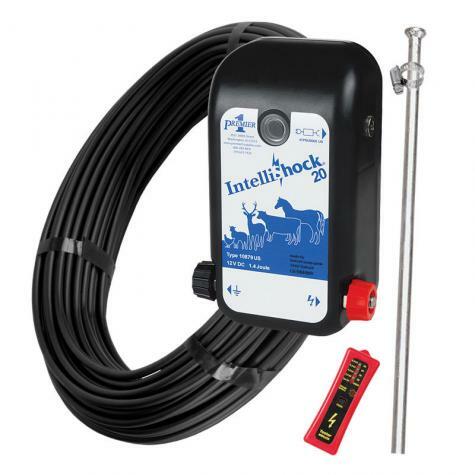 IntelliShock 20 automatically adjusts battery draw down by as much as 80% if the fence isn’t touching green weeds (e.g 1–2 strand horse, cattle, anti-deer fences; also most fences during the winter or when grass is dormant). Need to recharge battery is therefore much less in these seasons or situations. Very good unit. When we first received this kit, the 110 and 12volt plugs were missing. Premier 1 remedied the issue and shipped them out fast. Once we received the plugs, we hooked it up with the 110 plug. Instructions were easy and straight to the point. The kit is exactly what you need (minus electric wire, reels and poles) and is reasonably priced. This energizer packs quite a punch, and time will tell how it holds up. But, we believe it will last for a very long time; great kit at a great price. I am new to the electric fence market. My neighbor suggested I use this company. Shipping was fast and product meets and exceeds my needs. Would recommend to anyone needing this type of equipment.